There are a few smart home device types that your Google Assistant/Home can control natively. Lights, plugs and switches, and thermostats were some of the first, but recently we've seen the addition of dryers, washers, dishwashers, vacuums, fridges, and even scenes. However, one type of device I've been personally waiting for are smart locks. Up until now, all smart locks were, uhm, locked into using the Assistant apps for integration, and not the native smart home capability. So users of August locks had to "ask August to lock the door," and those with Vivint had to "ask Vivint if the door is locked," for example. That is cumbersome because it doesn't feel native (a different voice answers you) and it's voice match-dependent so every person in the household has to connect the app in their own Assistant account, otherwise Assistant/Home will refuse to answer. August is now part of the native supported devices on Assistant/Home. Well, it looks like lock support is underway, though Google hasn't officially announced it yet. Here's the small backstory of how we figured it out. 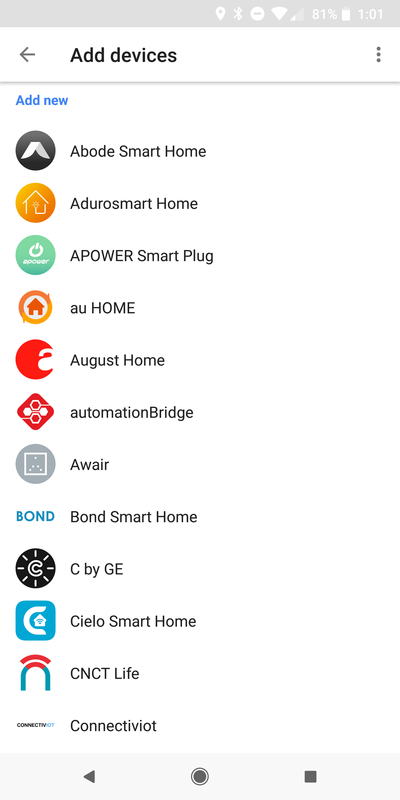 Reader Alvar Lagerlöf first spotted that August Home was showing up among the native services you can add to your Google Home/Assistant. Previously, August wasn't there and the only way to interact with it was through its Assistant app. We briefly wondered if August's doorbell cam was the one supported, like Nest and Logi, but Alvar then verified that "Locks" were listed among the native Smart Home Device Types available for Actions on Google (now gone). That left us scratching our heads, because the documentation in the dedicated Locks page (now 404) mentioned locking, reporting lock state, and unlocking... which could be a huge security risk. Above and below: Now deleted documentation for locks, including the incorrect "unlock" mention. We reached out to Google to ask if locks were now supported, which brands were on board, and what security measures were put in place to make sure that not anyone standing outside of a door can yell, "Ok Google, unlock the door," and hope that a Google Home sitting inside will obey. A day later, all mentions of "locks" disappeared from the developer documentation, but we expect they will be coming back soon. So it looks like the documentation jumped the gun a little in mentioning support for unlocking - all the better because there has to be a verification step in place. Alexa, for example, requires you say a pin code to verify it's you before unlocking a door or disarming a security system, and though I think that's not the best measure, at least it's something. I've verified with a friend that the August Home integration works. 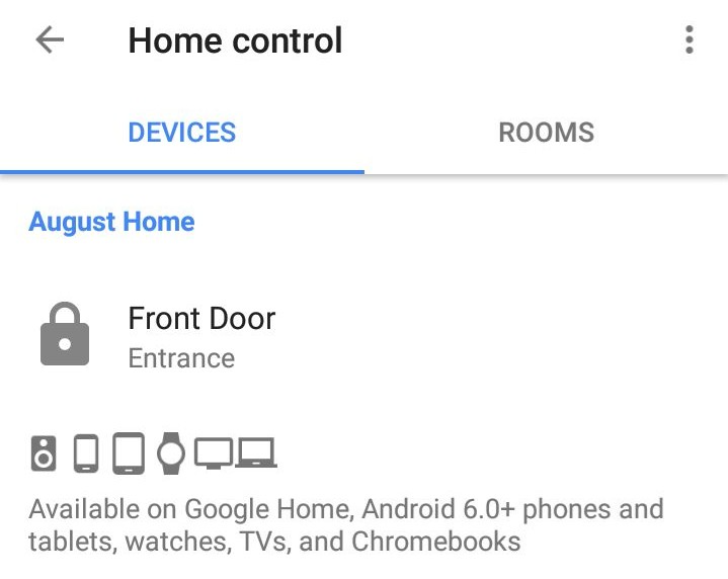 Here are a couple of screenshots of how it's supposed to look like once it's added to your devices in the Home control section of the Google Home app with its little dedicated lock icon, and how Google Assistant interacts with your locking command. Now I can say I know someone with 53 Hue devices. After some brief tests, Assistant seems a little capricious with responding to locking commands and locking state requests now: it's slow at times and unresponsive (stuck in a thinking state) at others. If you have an August or a Vivint door lock, give it a try and let us know how it works for you. Personally, I'm crossing my fingers for Nuki (EU smart lock) support, though I do like my IFTTT applet's locking answer: "Prison mode activated." With native support, I can't have a snippy reply like that.